I knocked on a strange door today knowing that I hadn’t a clue who was going to greet me. I also knew that my request was going to be perceived as quite a peculiar one. To cut a long story short, I’m currently researching the design ethos that governed Modernism. I’m finding this a little tedious, partly due to the fact that there were quite a few influential factors and contributors to the emergence of this ‘movement’. What’s even more confusing (and annoying) is the differing opinions as to when this movement began and ended. Generally speaking it commenced in the late 19th Century until approx. the 1940s. To make this as painless as possible and without getting bogged down in theory and technicality, it’s my understanding that Modernism (with regards to design) was all about rejecting ornamentation and historical influences. It was about simplicity, minimalism and function. It exploited advances in technology and new materials through its use of concrete, steel, glass, plastics and plywood. In a nutshell; that’s Modernism. Anyway, as I was conducting my research and observed the architectural feats (most of which didn’t appeal to me) during this timeframe I remembered a particular property that caught my attention many times as I passed it. I last saw this property many, many years ago. If I was going to guess the last time I clapped eyes on this property, I would say it was at least 10 years ago. Maybe more. My recollection of this property was a little hazy but I could easily visualise its flat roof and white façade as it nestled in between houses of the much more traditional, bricked and pitched roof variety. Was it an original example of Modernism? There was only one way to find out. I grabbed my trusty camera and drove the 6 miles (yes, 6 miles) to the area where I grew up and first witnessed this property as a child. Did I ever think that I’d return to the very property that I had coined ‘weird’ as a youngster to ask its owners if I could take photos of it? Not in my wildest dreams. I drove tentatively along the main road where I thought it was located. And then I slowed to a snail’s pace as I attempted to focus on the road ahead, navigate the car and glance at each house to my left as they passed me. And suddenly there it was. And it was exactly as I had remembered it!! I walked up to the front, sorry side door and knocked. A lady in her 60s, adorned in an apron opened the door and looked at me a little quizzically. But who could blame her, in this day and age she was probably expecting the worst. I explained that I was an Interior Design degree student and was currently researching Modernism. At this stage her husband was hovering in the background showing an interest in the one-way conversation that was taking place at his front, sorry side door. I was soon ushered into the hallway. I was standing in the hallway of a Modernist house! And then the questions started; did they know when the property was built; did they know who built it; how long had they lived in the property…yada, yada, yada. The man, who kinda resembled Pinocchio’s creator, Gippetto was able to produce the Deeds of the property in the same timeframe that it takes for me to find my TV remote (here’s a clue, my remote has its own seat on the sofa right beside me). How astounding! 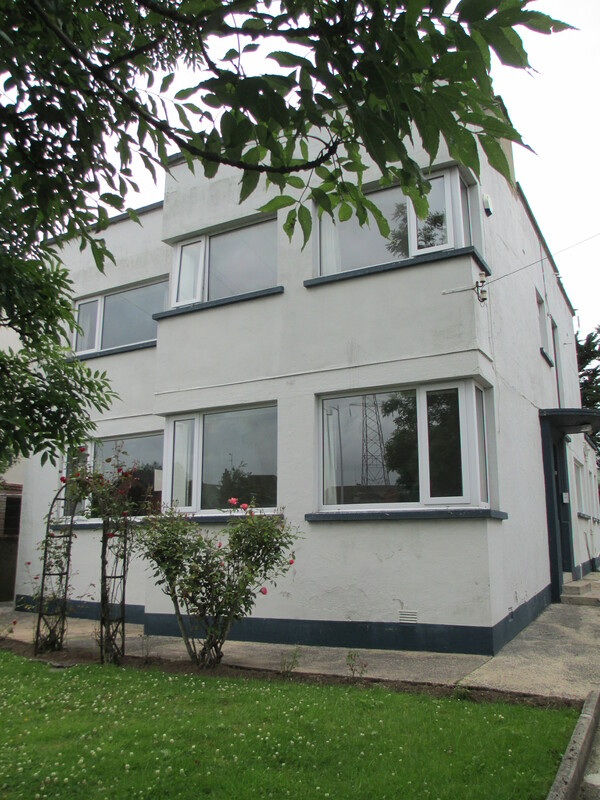 My biggest fear was that the house was built later than the Modernist period but it turns out that it was built in 1937. Awesome!! It was built by James Bradley (a builder) who had bought the land in 1936 for £900. I know this because Gippetto took delight in showing me the original mortgage application to the Halifax Building Society! As I was talking to the lady of the house Gippetto disappeared and I listened as she told me that they had lived in the property for over 20 years and had to carry out major repairs to the roof because the reinforced concrete beams were causing problems. Her husband eventually reappeared with photocopies of newspaper clippings that he had kept from 1987 – in my eyes, this man was the male equivalent of Mary Poppins. He had even used pink highlighter on the freshly copied pages to highlight certain sections. 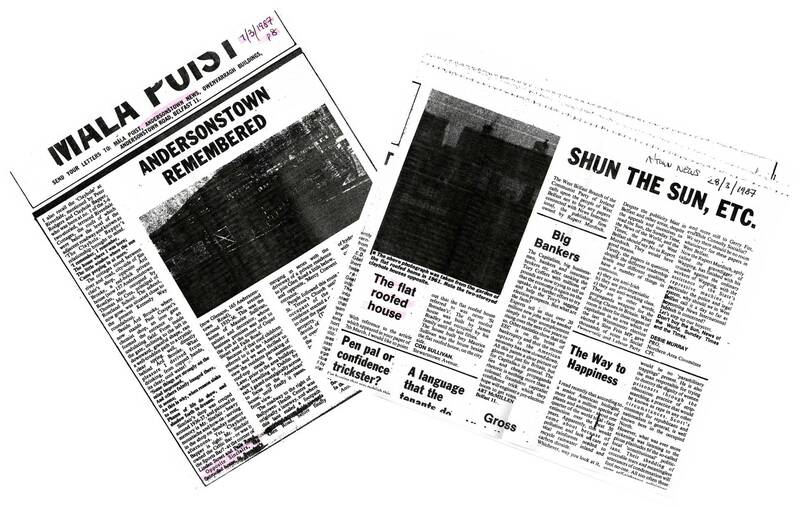 It was a local newspaper called ‘Andersonstown News’ and the article was a whimsical piece drawing on certain memories of the area where this property is located. 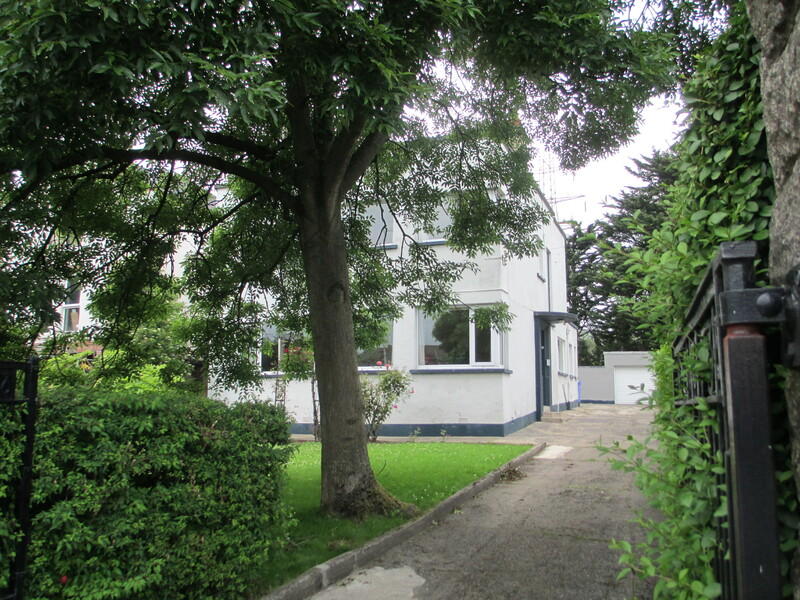 The article also mentioned ‘the flat roofed house’ and incorrectly cited its original owner as Maurice Sullivan. Gippetto then showed me another article by the same newspaper where someone had pointed out that the original owner was indeed James Bradley. 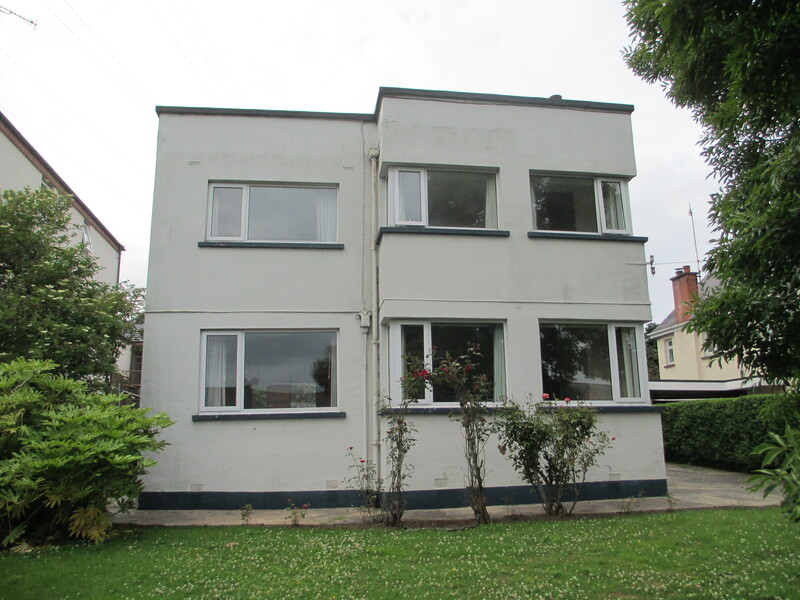 A slightly random event, yes but in the space of 30 minutes I revisited my youth, met a very lovely couple and realised that the ‘weird’ house I used to stare at as a child was actually a genuine product of 1930s Modernism. All in all, a pretty good day. I absolutely love modernist architecture (might have something to do with my love of concrete as a construction material). 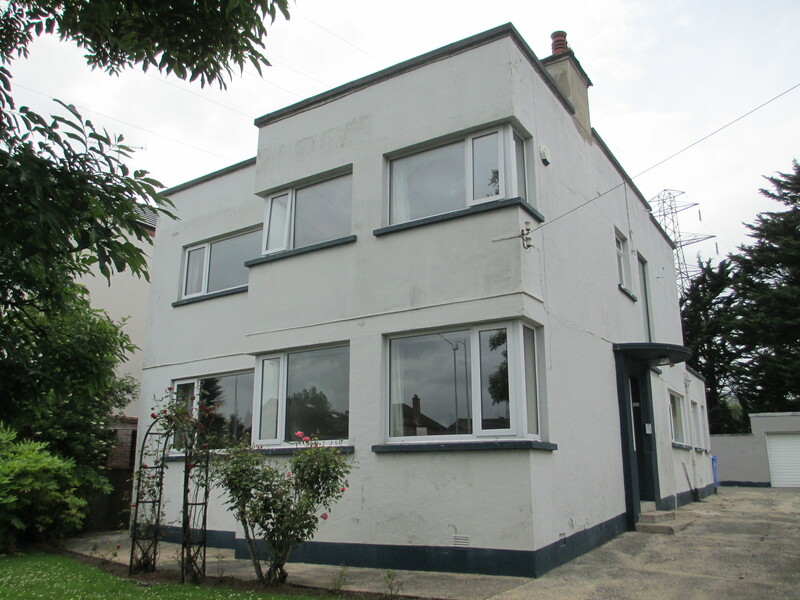 In contrast with the rest of Europe, modernism arrived in the UK quite late (the first modernist building is supposedly 1925 New Ways in Northampton) as is probably most visible in the post war social housing boom. When it first arrived it brought hope and optimism to the society battered by the war. There was this one really great sentence abut modernism in the book I’m currently reading saying that modernist aesthetic had the ability to reflect its surroundings without being in any way patronising. Wow Anita, what a great find and so lucky to have nice people willing to accommodate your enquiries. I wish everyone was as helpful as these kind people. This will be great material for the module, such a perfect example. Studying this subject makes you open your eyes to a whole new world! Thanks Melissa. Yep, it is a great find and you’re so right about this subject opening your eyes!